Azure VM management software is an application that helps organizations using Virtual Machines (VMs) on Microsoft´s Azure platform. The field of Microsoft Azure management software is broad ranging, including functions such as monitoring and analytics, identity and access management, and orchestration. However, the phrase “VM management” most commonly refers to Azure cost management and resource optimization. Azure VM management software is designed to help companies easily and automatically reduce cloud compute costs. The software for managing VMs on Azure provides a single dashboard view of multiple accounts, VM types and pricing options, so that organizations can manage their accounts with improved efficiency. Due to the single dashboard view and the versatility of Azure VM management software, organizations can maintain governance over their Azure accounts and create permission tiers for team members. The permission tiers allow team members to start and stop their own VMs without being able to interfere with other teams´ schedules – thus increasing team structure and accountability. Scheduling and rightsizing functionality, operated through a policy engine, make Azure cost management simple and automated. Microsoft Azure and public cloud use in general is growing year over year as more organizations adopt cloud services and expand their use of it. While the agility and flexibility of the cloud are important, there are pitfalls that organizations need to watch out for as they adopt cloud services. One enormous problem that comes with expanded use of the cloud is the potential for wasted spend. We estimate that over $14 billion will be wasted this year on public cloud resources that are not actually needed. This wasted spend comes from several sources. The first and largest segment is from Azure virtual machine that are left running when they are not actually needed. Azure VM pricing is by default charged by the hour – which means that it doesn’t matter whether you’re using the machine or not, you are still going to be billed for that time. While some of this wasted spend is contributed by VMs that have been spun up and are no longer being used at all, a more daily contributor is non-production VMs. By this, we mean resource being used for development, testing, staging, QA, and anything else that revolves around a typical workday and does not require resources to be running 24 hours a day, 7 days a week. Another source of wasted spend is oversized resources. When provisioning virtual machines in Azure, you will have the choice of multiple Azure VM sizes. Depending on the configuration options you choose, an Azure VM cost can range from less than one cent per hour to several dollars per hour. When you add that up over a month, that’s an enormous difference. The waste comes in due to overprovisioning – that is, users will choose Azure server sizes that are much larger than their actual usage. This is a huge source of waste. Just sizing down one size can save 50% of the cost, and sizing down two sizes can save 75%. Due to this it’s important for organizations to build cloud cost optimization solutions into their everyday processes. Azure VM management software is one easy, automated way to do this. Undoubtedly there are significant advantages of cloud computing. Organizations involved in developing, testing, and staging save considerably by hosting their applications in the cloud. However, there is still a price to pay for the services provided by Microsoft. Furthermore, regardless of the number of VMs hosted in the cloud, and the Azure options subscribed to, there will likely still be resource waste. One of the ways in which organizations can reduce cloud compute costs is to instruct team members to manually shut down non-production VMs. This strategy relies on team members remembering to shut down the right VMs, and to shut them down from with the Azure portal rather than from within the VM – a course of action that will result in Azure compute resources still being assigned to the VM. Although it is possible to develop scheduling scripts to switch off non-production VMs when they are idle, the resources required to develop the scripts may eliminate the benefit of implementing them. Scheduling scripts also fail to deliver the other benefits of Azure VM management software and the risk exists that, during scheduled idle periods, Microsoft could reassign the organization´s IP address. Similarly, organizations can instruct cloud users to always select the smallest size needed for a job. The main problem with this approach is that most developers do not know their utilization needs in advance, and are likely to oversize “just in case”. Additionally, they may not remember, and are highly unlikely to change Azure virtual machine sizes if their usage needs later decrease. Like manual scheduling, this “strategy” is unlikely to succeed. Alternatively, organizations can reduce cloud compute costs by subscribing to a Microsoft Enterprise Agreement (EA). This option is available to organizations with 500 or more users who can commit to a three-year contract. As beneficial as EAs may appear, organizations that later require less capacity for their VMs do not have the opportunity to reduce the level of service they receive. Consequently, rather than reduce compute costs, an organization´s costs could increase over the life of the contract. Azure VM management software eliminates the risk that non-production VMs will be left running overnight, that virtual machines will be routinely overprovisioned, that the development of scheduling scripts will be counter-productive, and that a decrease in capacity requirements could leave an organization locked into an expensive contract. It does this in two ways. The first way Azure VM management software reduces costs is by automating the scheduling process to temporarily stop non-production VMs during idle periods. In order to determine which VMs are suitable for “parking”, network administrators log into their Microsoft account through the application. The software for managing VMs on Azure conducts a discovery to identify the VMs running across all accounts, regions, and pricing options, and recommends which non-production VMs are suitable for parking according to their utilization history patterns, with secondary recommendations based on names and tags. Once the recommendations are accepted – or adjusted as necessary – the UI displays a grid indicating days of the week and times of the day. Users simply have to click on the days and times during which the selected VMs will be idle and set the schedule. If a VM is required during a scheduled idle period, the schedule for individual VMs can be “snoozed” so that they are ready to use. After the schedule has been set, the Azure VM management software displays a figure indicating the projected savings. As soon as the schedule is running – i.e. as soon as the non-production VMs are parked – actual savings will be displayed. An organization that parks its non-production VMs between 6:00pm and 8:00am on weekdays and throughout the weekend will typically reduce cloud compute costs by more than 70%. The second way Azure VM management software reduces costs is through “rightsizing”. In a similar way that scheduling recommendations are developed, rightsizing recommendations are also based on resource utilization history. The software will analyze this data for patterns, and recommend virtual machines that can be “rightsized” due to the capacity typically needed on those machines. Using the recommendations, users can choose to take a resizing action immediately. Alternately, if the sizing recommendation is for a virtual machine that is on an on/off schedule, the machine can instead be resized when it is next turned off, thereby fitting with the organization’s change control schedule. Rightsizing recommendations can be accepted manually, or if you prefer, you can create a policy to automatically accept and resize virtual machines that meet your criteria, thereby saving you time and keeping your infrastructure optimized. For both scheduling and resizing, the management software will provide savings estimates of how much costs can be reduced if the user accepts the recommendations. Then, downloadable reports are generated showing total savings, making it easy for users to justify the use of such a tool to themselves and to forward on to management. Typical ROI is 12X or more. ParkMyCloud´s Azure VM management software ensures that organizations only pay for the compute power they use. Our lightweight, yet versatile SaaS application makes it possible to stop every non-production VM by default and override the schedule to start the VMs whenever they are required. It also makes rightsizing as simple as the click of a button – or less, if automated policies are in place. These features of our software for managing VMs on Azure helps organizations reduce cloud compute costs to the minimum possible. While parked, the VMs are inaccessible. This enhances data security and prevents unauthorized access. It also eliminates the necessity for the parked VMs to be monitored by network security personnel or for unnecessary virus scans. These benefits were among the reasons why one of our satisfied clients commented: “There is literally no reason not to use ParkMyCloud”, and now we invite you to try our Azure VM management software for free. Our offer consists of a fully-enabled application, with full access and full control over your Azure VMs. There are no set up costs to start your thirty-day free trial and no credit card required. Once your free trial of ParkMyCloud comes to a close, there is no obligation to continue with our Azure VM management software, and – best of all – any money you save on your cloud compute costs during the free trial period is yours to keep. For more information about our Azure VM management software and our free trial offer, do not hesitate to contact us today. ParkMyCloud is a lightweight VM scheduling app and VM rightsizing app that reduces the cost of deploying non-production VMs. It not only recommends which VMs are suitable for scheduling, but also those suitable for rightsizing. Further mechanisms include a single-view dashboard and the option to create team roles for improved accountability. Businesses can save more than 70% on the cost of deploying non-production VMs and make further secondary saving. 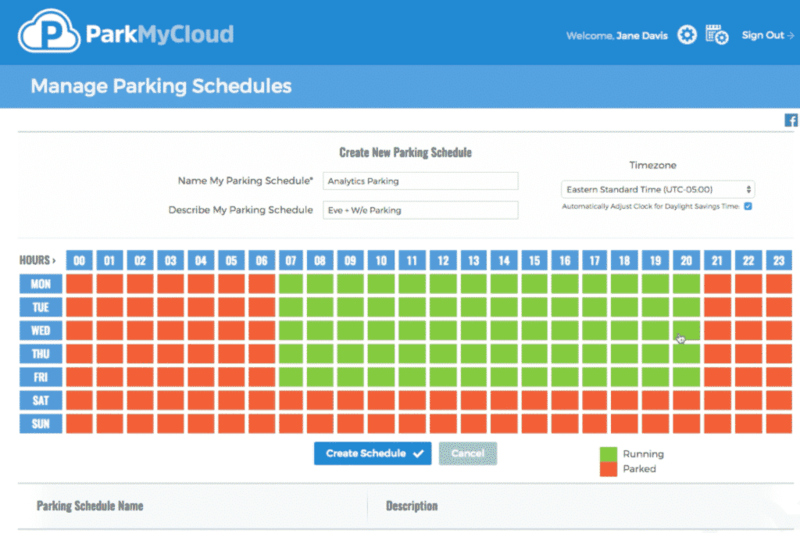 Click “Sign Up For Free” to begin your free trial of ParkMyCloud´s Azure VM management software.